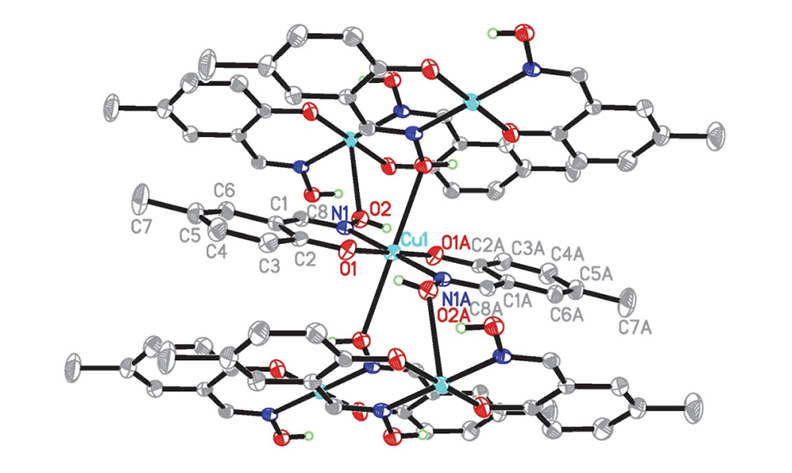 A centrosymmetric O-bridged polynuclear copper(II) complex, [CuL2]n, where L is the deprotonated form of the Schiff base ligand 2-hydroxy-5-methylbenzaldehyde oxime, has been prepared and characterized by IR, UV and single-crystal X-ray determination. There is a crystallographic inversion center in the complex. The Cu atom in the complex is coordinated by the phenolate oxygen, imino nitrogen and hydroxyl oxygen atoms from two Schiff base ligands, forming octahedral geometry. The complex was tested in vitro for its antibacterial activity.